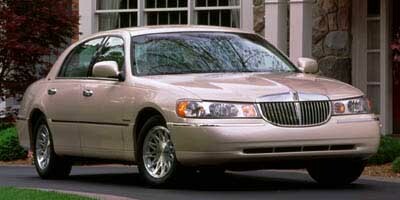 Factory equipped with an impressive 8cyl, 4.6l, 220.0hp engine and transmission, the 1998 Lincoln Town Car Cartier produces an impressive 17.0 city MPG / 24.0 HWY MPG. Desirable installed features include: Leather Seat Trim, Power Windows, Keyless Entry, Automatic Climate Control, a Premium Sound System, Heated Seats, Heated Mirrors, Steering Wheel Audio Controls, a Heated Passenger Seat, Chrome Wheels, Power Mirrors, Traction Control, Steering Wheel Controls, Power Locks, Rear Wheel Drive, a Leather Wrapped Steering Wheel, a Power Drivers Seat, an Auxiliary Power Outlet, a Driver Illuminated Vanity Mirror, Disc Brakes, a Gasoline Engine, Rear Reading Lamps, a Bench Seat (Split), Memory Mirrors, an AM/FM Stereo, a Drivers Air Bag, a Garage Door Opener, a Power Passenger Seat, an Adjustable Steering Wheel, Air Conditioning, Cruise Control, Anti-Lock Brakes, Intermittent Wipers, Child Proof Locks, an Auto Headlamp, a Passenger Illuminated Visor Mirror, an Auto Dimming R/V Mirror, a Reading Light(s), a Tilt Steering Wheel, a Spare Tire (Small Size), Vanity Mirrors, a Passenger Air Bag, and a Rear Window Defroster. This 1998 Lincoln Town Car Cartier also comes factory equipped with: a Tilt Steering Wheel, a Spare Tire (Small Size), a Rear Window Defroster, a Passenger Air Bag, Vanity Mirrors, and a Reading Light(s). the Premium Sound System turns every ride into a backstage pass, Keyless Entry which also has an emergency button on the remote which will cause the alarm to sound, attracting attention and scaring off potential thugs, and Change to your favorite station with Steering Wheel Audio Controls. aGarage Door Opener giving you the ability to open the door with the touch of a button and Auxiliary Power Outlet if you're looking to plug your modern 12v accessories into your dash.